I confess: my creative mind let me find inspiration everywhere and bring me to have "the unhealthy habit" of collecting everything about recycling. Last week for example, before the bad weather hit North Italy, walking in a garden, I picked up some autumn material to put in an table centerpiece: a few acorns, a few leaves with unthinkable autumn colors (black and purple? ?) some red berries. 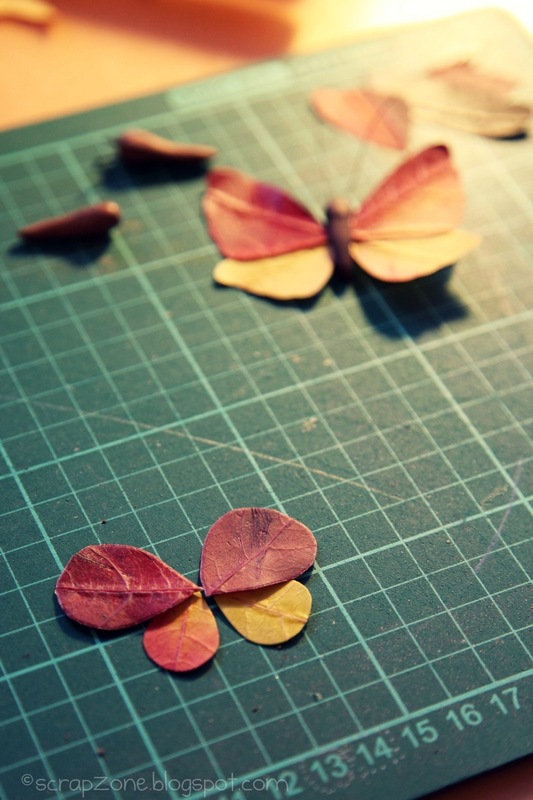 With any surplus leaves I created these butterflies. How is it made? Very very easy! 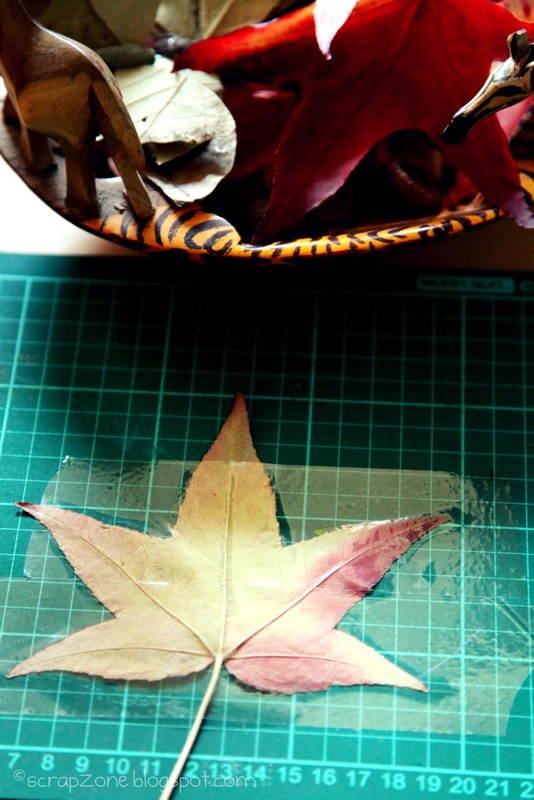 Apply some strips of transparent tape to the back of a big leaf. This will help you to preserve the butterfly when the leaf will be dry. In addition, you will be facilitated in the cutting phase of the wings. 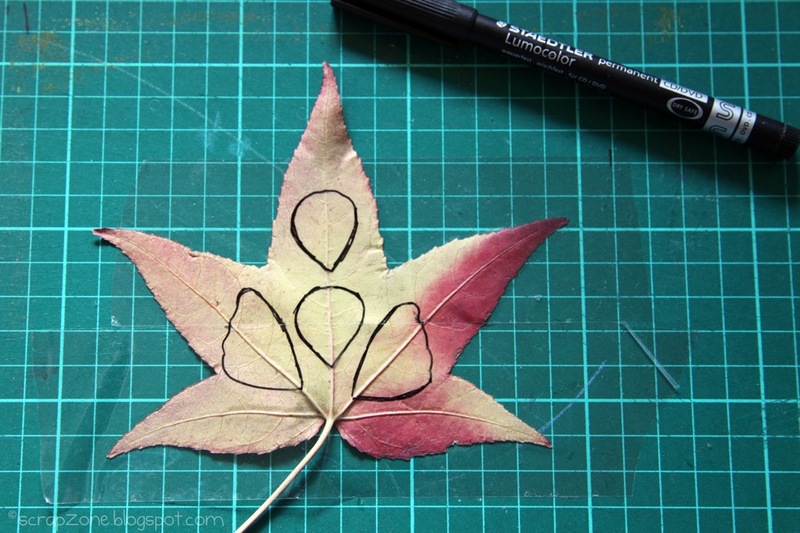 Now you can draw 4 butterfly wings on the back of the leaf directly on the tape. Cut all the wings and assemble them with glue. 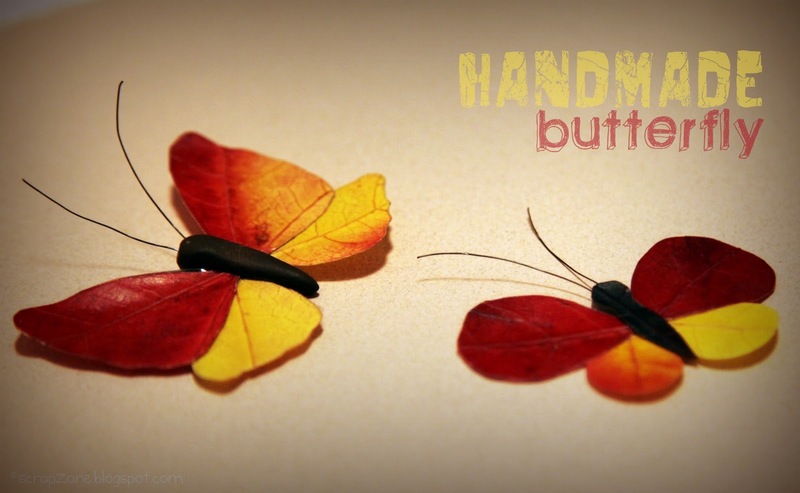 You can create the body of the butterfly using Fimo (or any polimer clay) or cut it directly from a dark leaf. For a brilliant effect try with Glimmer Mist: sprayed it on the wings for a sparkly look! Let dry the wings under a book. I enjoyed a lot to create some simple butterflies and more elaborate. I'll use the butterfly with the body in fimo to decorate a gift and the other with the body in leaf...Tomorrow I'll show you where it flew! ma come sono belle queste farfalle... fantastica idea, complimenti!!!! Ma che meraviglia Giuli!!! Fantastiche!!! Ciao Giulia, volevo ringraziarti per la visita al blog e farti imbocca al lupo per il blog candy! Ricordati che per partecipare bisogna anche essere iscritte al blog! Nooooo ma sono troppo stupende!!! Complimenti per la fantasia che hai ^_^!!! ciao cara Giuli, quanto sono delicate queste farfalline-foglia! che idea fantastica.. adoro le foglie nei colori autunnali..